What can your marketers learn today to better support patients tomorrow? 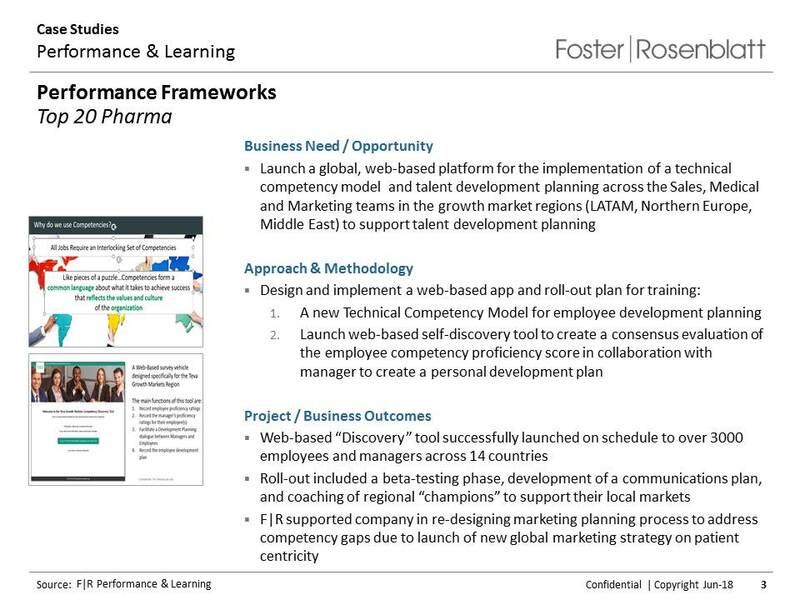 Foster|Rosenblatt is a customer-centric performance & learning vendor/partner. We are deep content experts who specialize in marketing excellence for the life sciences industry, and our leadership has over 25 years experience delivering dynamic training solutions to over 12,000 marketers globally. We assess company and/or individual capabilities, identify knowledge, skill & performance gaps and develop premium development solutions using cutting-edge learning technologies. Given the right knowledge, the right skills, the right tools & the right opportunity to succeed, people achieve great things. F|R Performance & Learning helps people achieve great things. We possess the knowledge, capabilities and experience to help you cultivate a thriving and successful learning culture. We are a proud to be a preferred industry partner of LTEN. 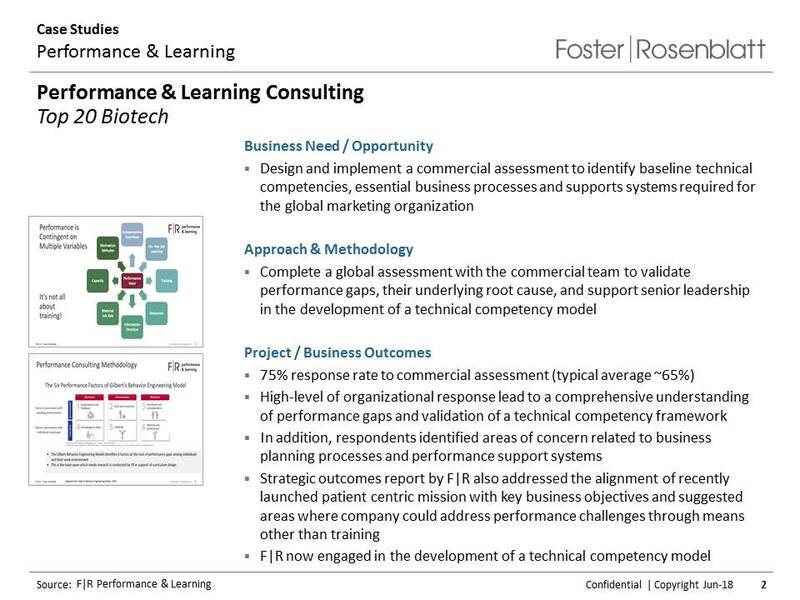 We are experts in both learning & development pedagogy and life sciences marketing content. Our practice develops marketing excellence curricula that cultivate the knowledge and skill of the marketing and cross-functional commercial organization. 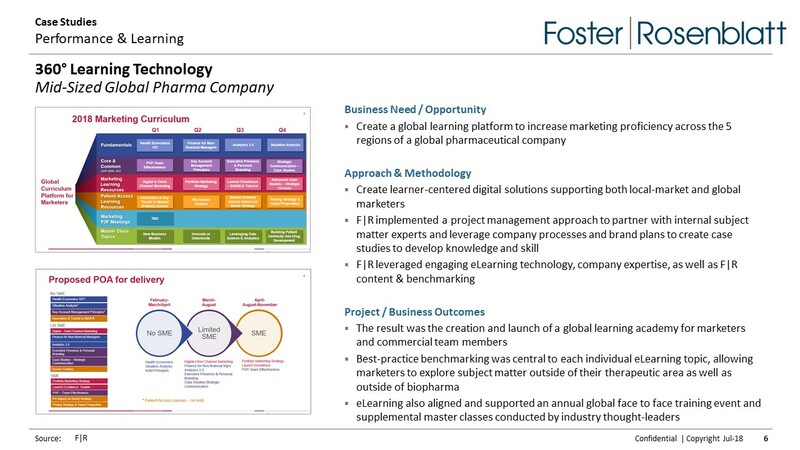 Off-the-Shelf Marketing Development Training Programs: These programs include Marketing Pharmaceutical Products | Pharmaceutical Market Research | Forecasting Healthcare Markets & Products | Advanced Pharmaceutical Marketing & Portfolio Strategy | Segmentation & Positioning. Custom Live Training Curricula & Programs: Our senior domain experts develop content and deliver programs that address all aspects of life sciences marketing. From customizing our off-the-shelf programs to developing truly bespoke solutions, we offer educational opportunities that can be tailored to professionals at all career stages. eSolutions: To be time efficient or to simply accommodate best practices in the delivery of certain content, F|R offers Webinars | eLearning Modules | Simulations that ensure the most effective modern modalities of professional development are employed. Public Live Marketing Development Training Programs: In addition to offering the off-the-shelf training programs to our individual company clients, we offer these same courses in public forums that cater to the needs of small groups or individuals whose employers are not currently sponsoring in-house programs.  We deliver a wide range of performance and learning advisory services. We have robust diagnostic methodologies to evaluate and characterize the current level and breadth of capabilities in organizations & individuals. Additionally, we deliver a corresponding range of customer-centric performance solutions for marketers and the cross-functional commercial team. Performance Assessments: We evaluate the current level of performance in business functions and individuals by objective best practice criteria appropriate to each circumstance. Learning & Gap Analyses: Our team benchmarks and compares actual performance of the organization and individuals to a standard that is industry best practice or your company’s desired state of performance. Performance Objectives: We can help you set performance objectives on the business unit or individual level based on the strategic and tactical objectives of your company. Based on the needs of your organization, we work with you to define the business outcomes that you require from each part of your organization. From this we can compose performance frameworks that optimize client-facing marketing and cross-functional commercial team capabilities. Additionally, these frameworks serve as performance guideposts that attract, retain and develop your team members. Capability/Competency Model Assessment & Development: These models incorporate all aspects of the required business processes and outcomes that your team members must deliver. Solution Design, Development & Implementation: We don’t stop at simply designing a solution that right for you. We can work with you to fully implement appropriate performance frameworks that will have immediate impact on your organization. Learning Metrics & Performance Evaluation: We are expert in assessing learning and performance. We use a combination of descriptive and predictive measures that objectively and empirically evaluate business functions and individuals. 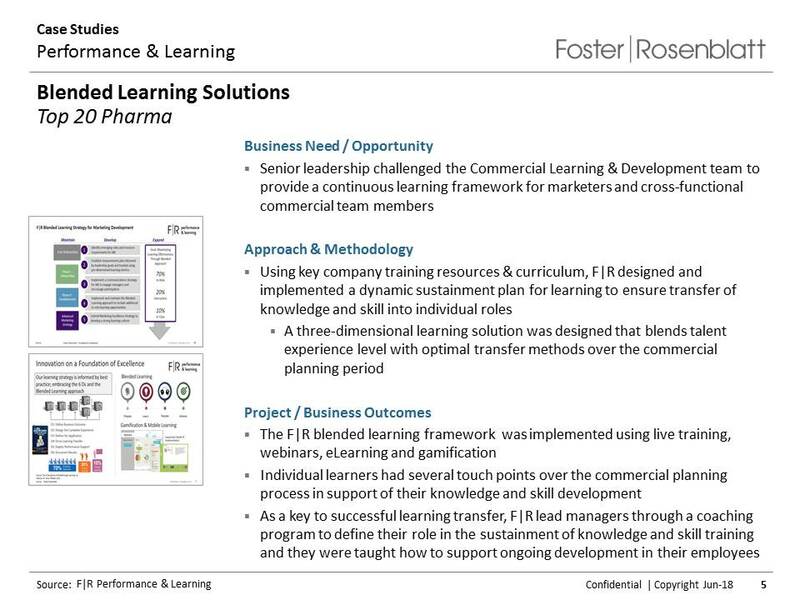 We have experience designing and implementing dynamic learning frameworks for many of the world’s largest life sciences companies. Our work harnesses structure and content from both academic and experiential practice to create an organization-wide learning culture. We believe that our learning frameworks have a direct effect on the technical infrastructure of a specific learning environment, but more importantly, our solutions have an intense effect on the ecosystem that is professional development. Instructional Design Consulting & Support: Our teams are populated with formally trained instructional designers that complement the content experts with whom they are partnered on every engagement. We believe that content does not teach itself and that there is an optimal approach and modality for every learning objective. 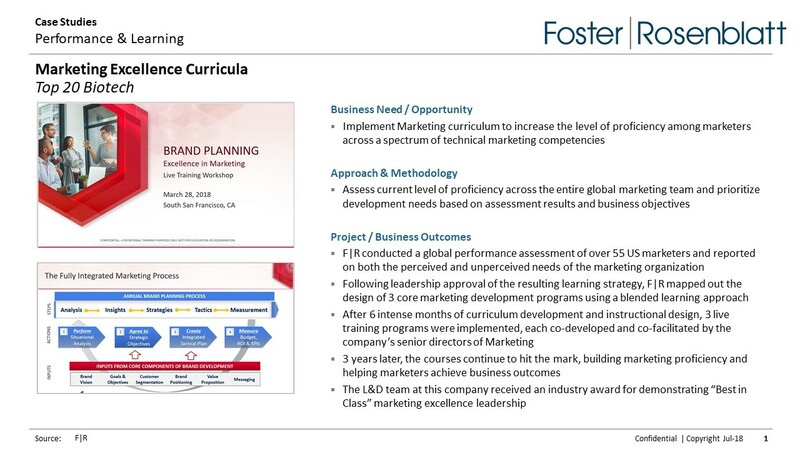 Curriculum Strategies & Development: Foster|Rosenblatt is both a “performance & learning agency” and a fully dedicated “marketing consultancy.” With this combination, we are able to package and deliver cutting-edge marketing content that populates any curriculum that we develop. We offer hybrid learning opportunities that combine traditional classroom methods with mixed-mode instruction and technology-mediated delivery. Thus, whatever the objective of the learning may be, we have a modality to accommodate flexibility in the time, place, path or pace if instruction. Our three dimensional learning solutions blend talent experience level with optimal methodologies over the commercial planning period. Customized Learning/eLearning Programs, Courses and Modules: We provide technology-mediated techniques that support the concept that a student can benefit from the efficiency of blended learning approaches where each adult learner has some control over his/her curricula. Onboarding, Learning Reinforcement & Sustainability Strategies & Tactics: We offer a range of learning solutions that support specific moments in an employee’s tenure at your organization. We have approaches and content that ensure effective career transitions or sustain a high level of ongoing professional development. Our team is expert in learner-centered digital solutions. Our work supports the explicit needs of all marketing functions in both headquarters and the local market companies. Supported by our deep content expertise and the knowledge resident in your organization, we leverage technology as a force multiplier in the effort to build a high performance organization. Microlearning: We build bite-sized elearning modules, typically three to five minutes in length, accessed through mobile learning methods. Social Learning: We have an integrative approach to learning incorporating observation, retention, reproduction and motivation. Personalized Learning: We offer training and curriculum via a diverse variety of programs, experiences and instructional approaches that are specific to a given job level/role. Mobile Learning: We conduct training that uses portable devices such as smartphones or tablets. Gamification: We have services that design and build integrated computer-based games that motivate participation, enhance engagement and improve knowledge retention/learning loyalty. Content Curation: We can help you located, amass and characterize content from a variety of digital sources that can be provided to a learner in an easy-to-access organized fashion. Business Simulation: We provide experiential learning techniques that utilize-computer-based models to replicate real-life business situations. This scenario-based and quantitative-based method allows learners to practice strategic business planning in a risk-free environment. Don is a life sciences subject matter expert who specializes in organizational performance and personal learning solutions. He has over 25 years experience in this area and has trained over 12,000 marketers globally. 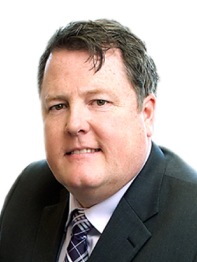 Don’s work focuses on providing individuals and companies with the right knowledge, skills and tools to optimize their success. Specifically, he performs diagnostics, designs performance & learning frameworks and builds solutions that are directly linked to the overall objectives of the organization. 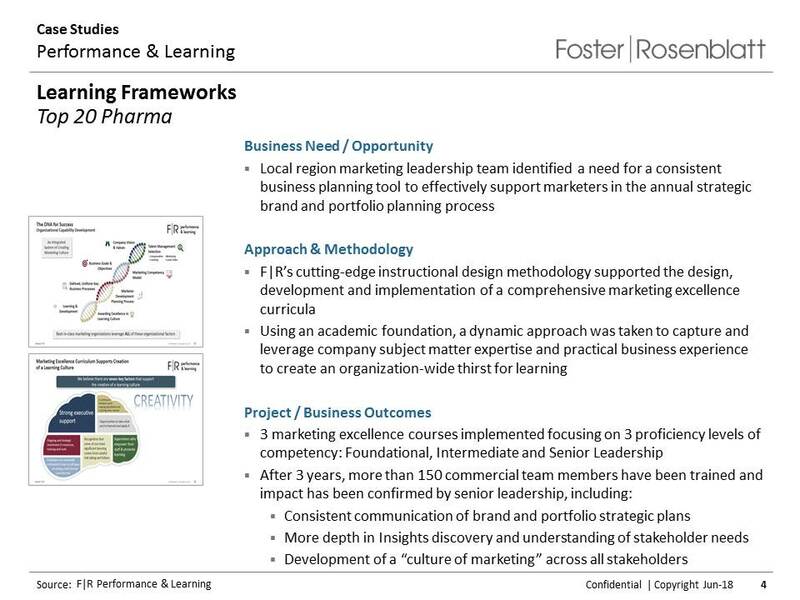 Prior to his work in performance and learning, Don was a content-based management consultant supporting the business intelligence and general marketing needs of many leading biopharmaceutical brands. Carolyn is an energetic leader with vast experience in biopharmaceutical Sales & Marketing. Known for maintaining the ‘line of sight’, Carolyn’s collaborative approach to solution generation and strategy definition/execution generates results. 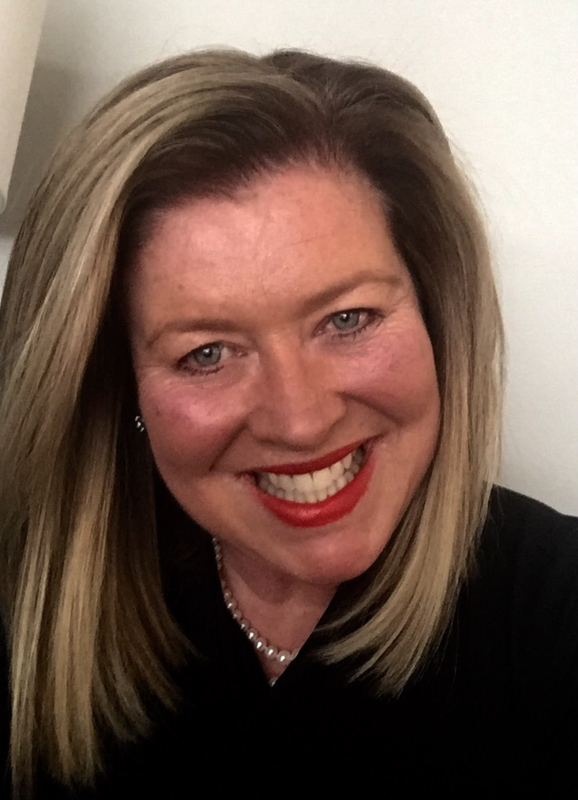 Jackie is a pharmaceutical leader with broad industry experience in marketing, performance and learning, commercial development (B2B sales), Sales Management and Key Account Management. A collaborative leader who is known for her strong business acumen, change agility, innovative thinking and communication skills. 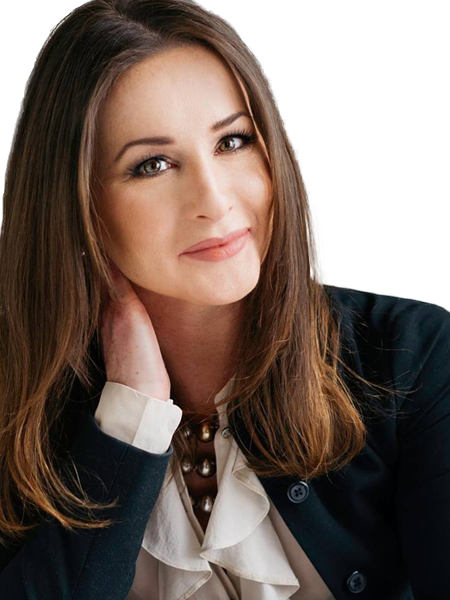 Jackie partners with clients to understand their goals and objectives, develop strategies to grow internal strengths and capabilities and achieve business objectives.